Toyota Motor Philippines gave a sneak peek of its all-new 2016 Fortuner at its annual media thanksgiving party last January. And now, they’ve revealed even more tidbits including one, interestingly enough, that has to do where the Philippines will source Toyota’s PPV or Pickup-based Passenger Vehicle. The third of the IMV or Innovative Multipurpose Vehicle range, the Fortuner was first launched in the Philippine market in 2005. It soon became one of the country’s most sought-after vehicles and has been a strong seller for Toyota. Having such a legacy on its shoulders, the all-new Fortuner remains an important vehicle for Toyota Motor Philippines. With retail sales starting by the middle of March, TMP set a lofty target of moving some 2,000 units of the Fortuner on a monthly basis. To accomplish this, the all-new model must have a sleek and eye-catching design that emphasizes stylishness and presence. According to chief designer Hiroki Nakajima, the main challenge is to make a modern SUV without the outdated boxiness of the previous model. 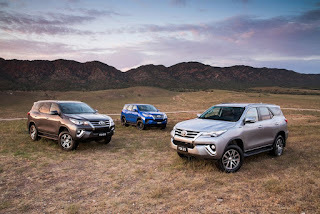 The all-new Fortuner is longer and wider than the outgoing model and features bi-beam LED headlights with daytime running lights on higher trim models. It’s set apart by the three “iconic” lines found on the side as well as available 18-inch alloy wheels. At the back, it also has LED tail lamps as well as a shark fin type antenna. Inside, the Fortuner has a Hazel Brown interior for all V grade models and lighter Chamois colored interior for the G grades. It boasts of increased headroom for the front passengers as well as a more spacious second and third row. Though the third row seats still fold sideways, it’s easier to flip up thanks to a spring-loaded mechanism as well as hooks located within reach of the luggage compartment (aft of the D-pillar, actually). The interior has 12 cup holders. In terms of performance, the all-new Fortuner features Toyota’s next-generation D-4D and VVT-i equipped engines. The 2.8-liter engine in the 2.8 V 4x4 has 174 horsepower at 3,400 rpm and 450 Nm at 1,600 to 2,400 rpm while the 2.4-liter engine in the V 4x2 and G Diesel variants have 147 horsepower at 3,400 rpm and 400 Nm of torque from 1,600 to 2,400 rpm. The 2.7-liter G variant boasts 163 horsepower at 5,200 rpm and 245 Nm of torque at 4,000 rpm thanks to Dual VVT-i. The 2.8-liter V Diesel 4x4 boasts of a part-time four-wheel drive system (eliminating the outgoing model’s full-time system), Active Traction Control, and Hill Start Assist. It also has Vehicle Stability Control and Trailer Sway Control. Seven airbags are also standard on the V 4x4. The most interesting part of the all-new 2016 Toyota Fortuner is where the Philippines will source its units. While the outgoing model was imported as a CBU from Thailand, the all-new model is a CBU from, surprisingly, Toyota’s Indonesia assembly plant. Whether or not this move will have any discernable effect on build quality remains to be seen. Whatever the case, this is one move that everyone didn’t see coming. IIRC the fortuner never came with full time 4wd. Yes it did. First generation one had full-time 4WD with separate low range. We know because we have one. Sayang, VSC + full-time 4wd would have been more fun/safe. Nice find. Funny how Toyota Motor Philippines hasn't said anything about where we source our Fortuner units until now. I think that's why it came as a surprise to us during the IMV Deep Dive. Still, if that's the case, the assembly is more or less the same then. I can attest to that since I have the first-generation Fortuner and test drove the face-lift versions. Mine is a 2014 and it's from Indonesia. I know because all the labels says assembled in Indonesia including the tag in the engine with dates when it was assembled. Its a good thing the gas tank cap is on the driver side. This shows that the body is an orig left-hand-drive. Some car models have a right-hand-drive body where the cap is located on the opposite side of the driver, and the rear door opens from the opposite side (like the previous model Ford Everest). So the new Innova and Fort will both come from Indonesia. If you ask BMW, they have the gas cap on the right side because of safety reasons. If you need to fill up using a jerry can, it's best to do it on the side of the shoulder, which is the right side for those driving on the left. Agree, but tank filling by jerry cans seldom happen. Its a hassle to fill up at the pump when you have the tank on the other side, especially in the US where most stations are self-service. While in PH, its hard to monitor the pump display when parked on the other side. Kudos to Toyota for doing whats right on the Fort, and hopefully on the new Innova as well.